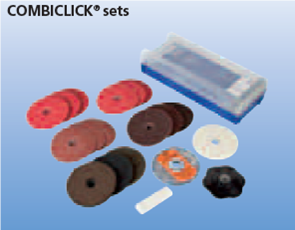 Home / Abrasives and Cutting tools / Linishing (sanding) discs, Roloc style quick change discs. / Pferd Combi click Stainless Steel mirror polishing system. The Pferd Combi click system can be used on any application that requires a variety of finishing products to achieve your required surface finish, No need to have multiple tools and cables, one grinder fits all discs. The system needs no special tools and can be run on commercially available angle grinders.